Before you get started with the P90X workout you need to do the P90X Fitness Test. Its going to tell you where you stand right now and give you something to compare to after you finish your 90 days. It’s also going to tell you if you should even do P90X right now or instead do something like the Power 90 workout to better prepare yourself. It takes about 40 minutes to complete and be sure to do the exercises in order. If you bought P90X you can find the instructions on how to do the P90X Fit Test in the workout guidebook. If you lost the book then here is everything you need to know. 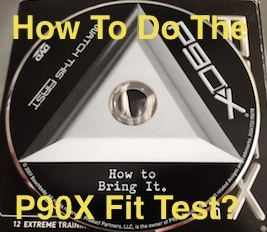 What Do You Need For The P90X Fitness Test? What Are The P90X Fitness Test Moves? Resting Heart Rate – If you don’t have a heart rate monitor than take your pulse by counting the beats on your neck or wrist for 30 seconds than multiply by 2. 10 Minute Warm Up – Jumping Jacks or a light jog in place. Enough to build up a sweat. Pull Ups – Do as many wide grip pull ups until failure. Men should be able to do 3 and women 1. If you can’t do any which is common for a lot of people than use resistance bands instead. Vertical Leap – Put your arm straight up against a wall and record the height. Then take one step back and jump up. Record the differences between the two to get your vertical leap. Men should have a leap of at least 5 inches and 3 inches for women. Push Ups – As many as you can do to failure. Men should be able to do 15 and 3 for women. Toe Touch – Measure how far you can reach past (or not) past your toes. No less than minus 6 inches for men and women. Wall Squat – Record how long you can stay in a chair position pressed against the wall. Should be able to do at least 1 minute. Bicep Curls – Do as many front facing bicep curls as you can. Should want to select a weight you think you will max out at 10-15 reps. Men should be able to do 10 curls with 20 lbs and 10 curls with 8 lbs for women. In & Outs – Raise feet off the ground. Bring knees in towards your chest and then straighten them back out. Do as many as you can without touching the floor. Should be able to do at least 25. Heart Rate Maximizer – Jumping Jacks for 2 minutes non stop with the last 30 seconds being as fast as you can go. Record your heart rate immediately after, 1 minute after, 2 minutes after, 3 minutes after, and 4 minutes after. You should be able to complete the 2 minutes of jumping jacks. Write all of your numbers down as you will record them on day 90 also. This is the best way to compare how far you’ve come with P90X. If you did more than the minimums for each then you are ready to get started with P90X. You only need to figure out if the Lean, Classic, or Doubles routine is best for you. If you were able to do more than the minimum on most of the moves then you’ll be able to get started with P90X. It’s normal for most people to not get a couple of them. If you did not hit the minimums on any of them then you might want to look at doing Power 90 to build up your strength and then come back to P90X. There are people who will power through and do well with P90X even though they don’t do well with the P90X Fit Test. Keep in mind that the first month or two will probably be very challenging.